The Korte Company was awarded a design-build contract for the design and construction of the United States Postal Service Southern Maine Center via a competitive, best value competition. The multi-story, 429,000 square foot facility is constructed of tilt-up concrete wall panels with a structural steel framing system. Tilt-up panels serve a dual purpose, exterior closure and load bearing elements, reducing material usage and reductions in HVAC system size and air infiltration. The Workroom is the largest space within the facility and required significant planning and sequencing to incorporate Korte and USPS furnished and installed processing equipment. Secure stamp storage vaults and mesh-partitioned secure storage areas were constructed in the processing area. A two-story 93,600 square foot space houses the office and administration functions and features a combination of fixed partitions and open office furniture. In addition, training space is provided within the administration area. A full service, fully equipped commercial kitchen designed to serve 500 meals per day is adjacent to the employee dining room. Employee locker rooms and customer mail acceptance units were constructed within this space. The building is served by an energy efficient central plant, four-pipe HVAC system with water cooled chiller. Hot water radiant heat is provided at the loading platforms. Sophisticated telecommunications, network, fire alarm, security, UPS, CCTV, energy management, and public address/mass notification systems were provided. Korte’s design team analyzed the capacity of the mechanical and electrical systems and reduced the size of both systems to save initial and long term operating costs. 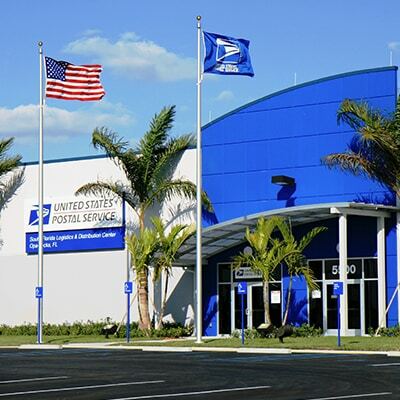 We’re proud to build for the USPS and distributors nationwide. Learn more about distribution center design and construction from The Korte Company. After almost four dozen projects with the U.S. Postal Service, you could say we've got these jobs down to a science.We took lots of notes along the way, and we want to share what we've learned.